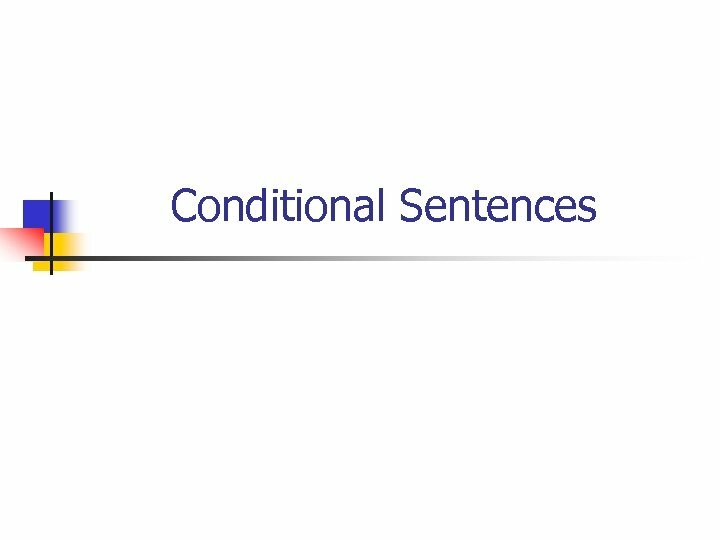 Conditional Sentences Types : Ø The order of the two clauses is flexible, it’s not important. 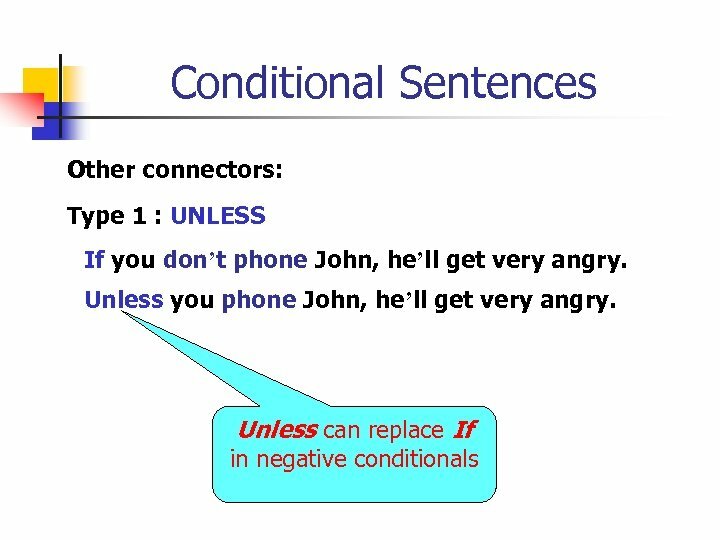 But if the if-clause comes first, it must be followed by a comma. 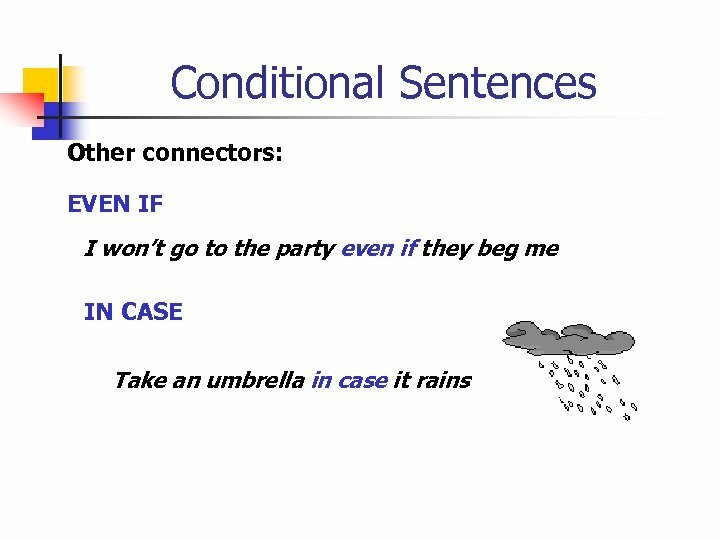 If it rains, I’ll stay at home Ø There are 4 types of conditional sentences. 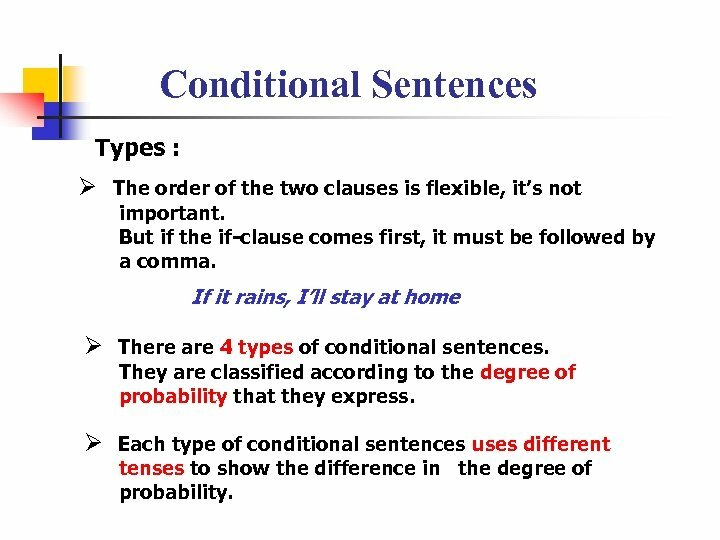 They are classified according to the degree of probability that they express. 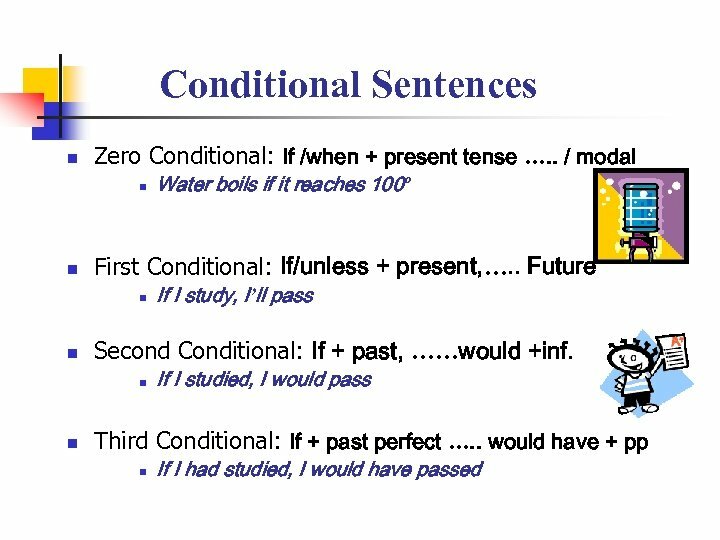 Ø Each type of conditional sentences uses different tenses to show the difference in the degree of probability. 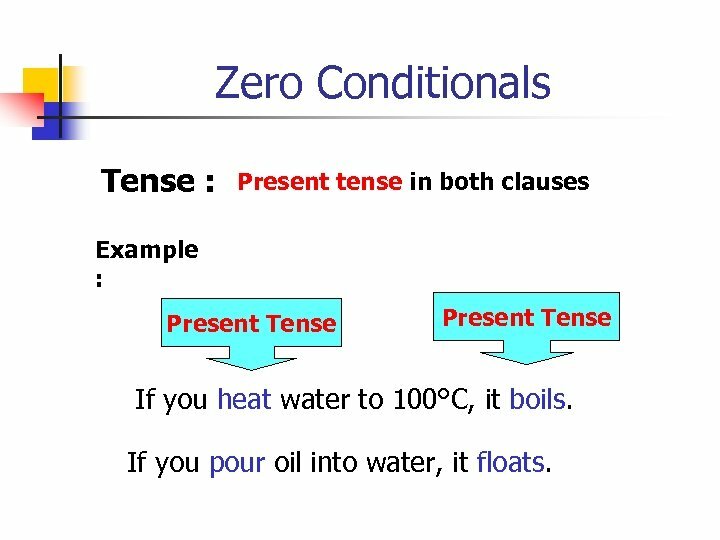 Zero Conditionals Tense : Present tense in both clauses Example : Present Tense If you heat water to 100°C, it boils. If you pour oil into water, it floats. 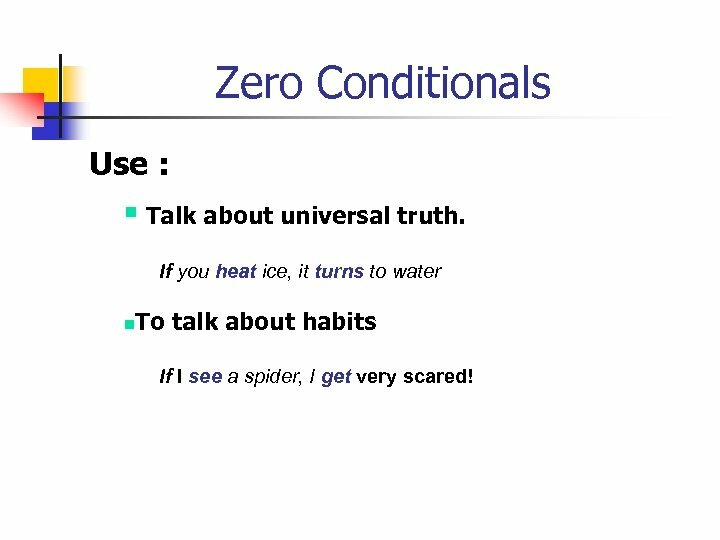 Zero Conditionals Use : § Talk about universal truth. If you heat ice, it turns to water n. To talk about habits If I see a spider, I get very scared! 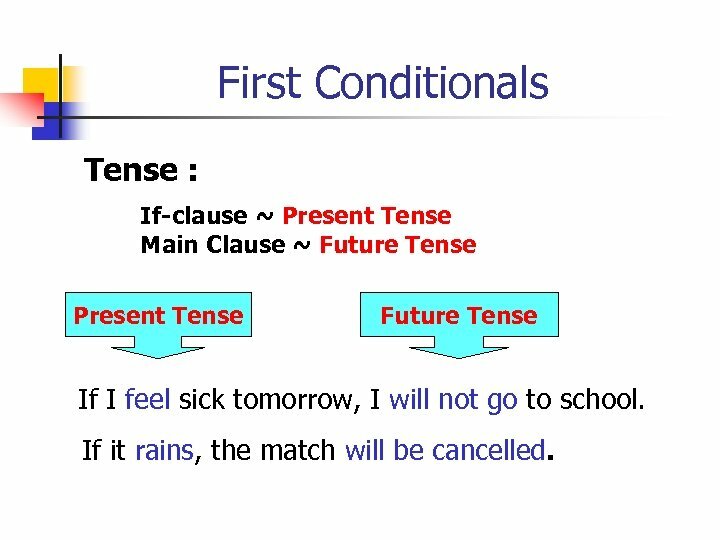 First Conditionals Tense : If-clause ~ Present Tense Main Clause ~ Future Tense Present Tense Future Tense If I feel sick tomorrow, I will not go to school. If it rains, the match will be cancelled. 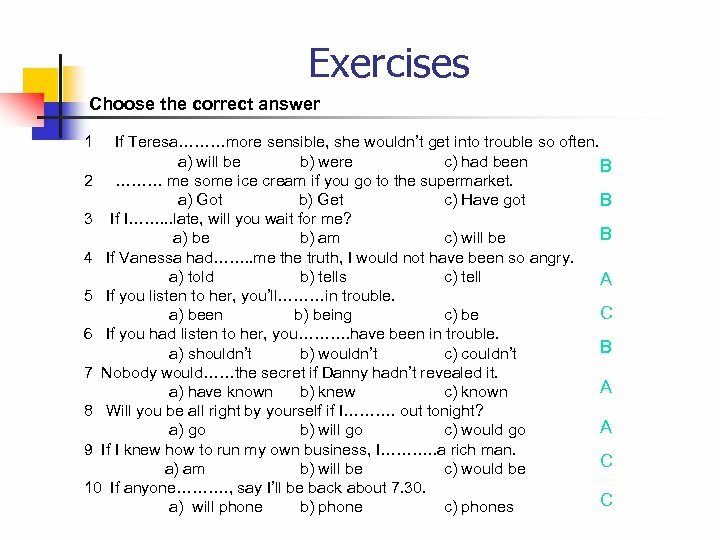 Exercise One. 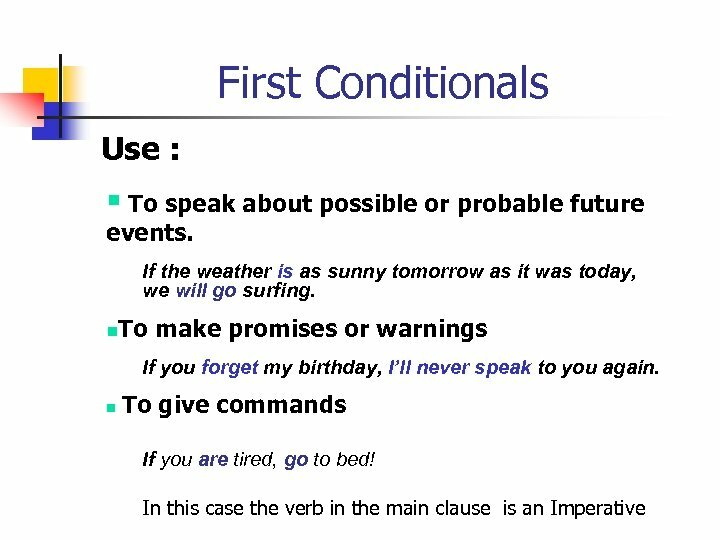 First Conditionals do not come 1. If you __________ (not come), will miss You ________ (miss ) the show. will buy 2. John _________ (buy)a car if he gets _______ (get) a job. 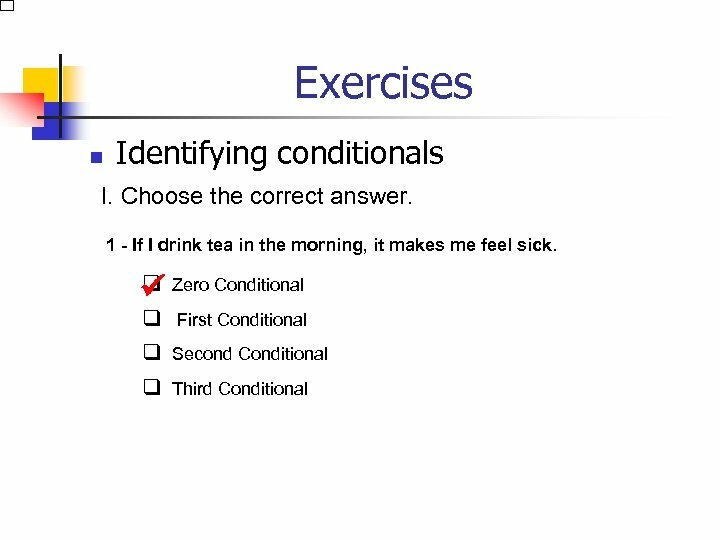 will get 3. 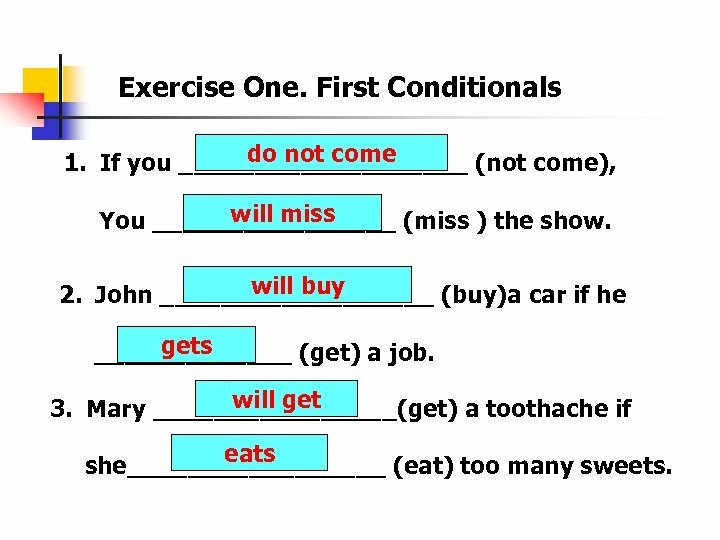 Mary ________(get) a toothache if eats she_________ (eat) too many sweets. 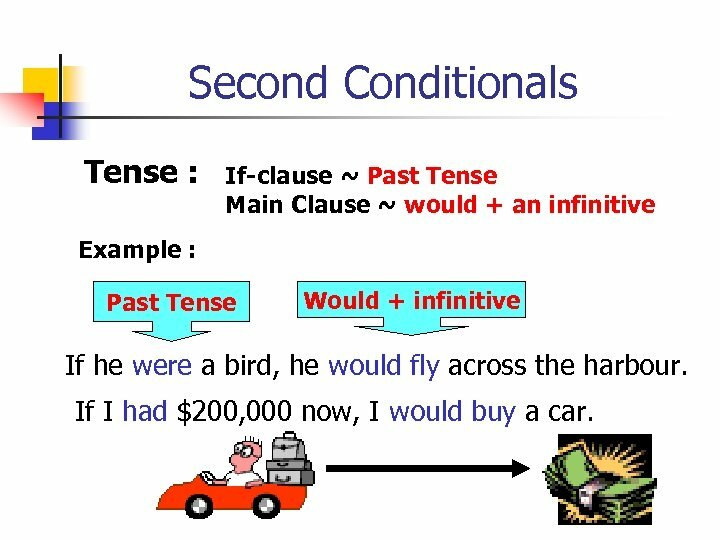 Second Conditionals Tense : If-clause ~ Past Tense Main Clause ~ would + an infinitive Example : Past Tense Would + infinitive If he were a bird, he would fly across the harbour. If I had $200, 000 now, I would buy a car. 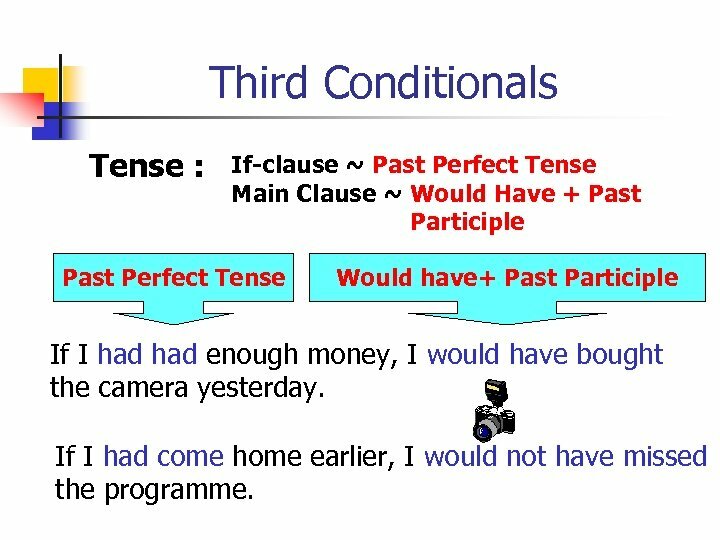 Third Conditionals Tense : If-clause ~ Past Perfect Tense Main Clause ~ Would Have + Past Participle Past Perfect Tense Would have+ Past Participle If I had enough money, I would have bought the camera yesterday. If I had come home earlier, I would not have missed the programme. 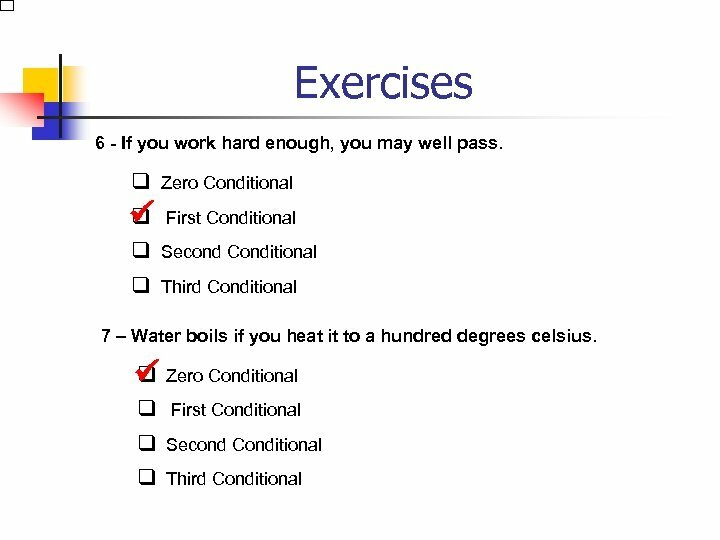 Exercise Two were 1. 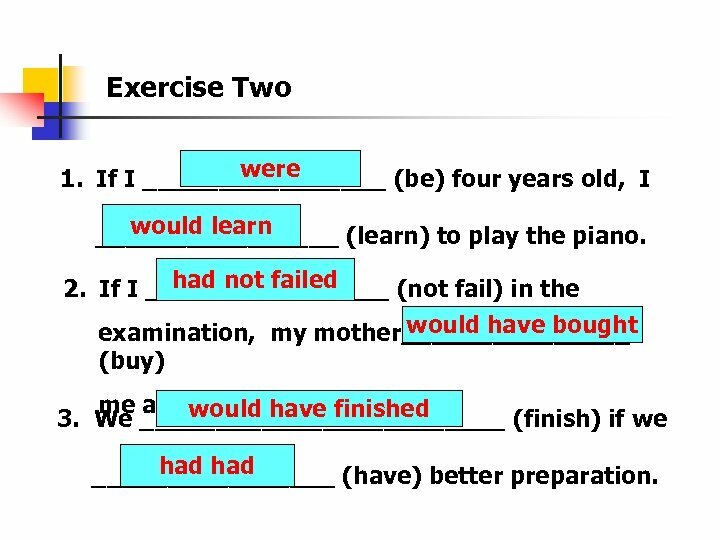 If I ________ (be) four years old, I would learn ________ (learn) to play the piano. had not failed 2. 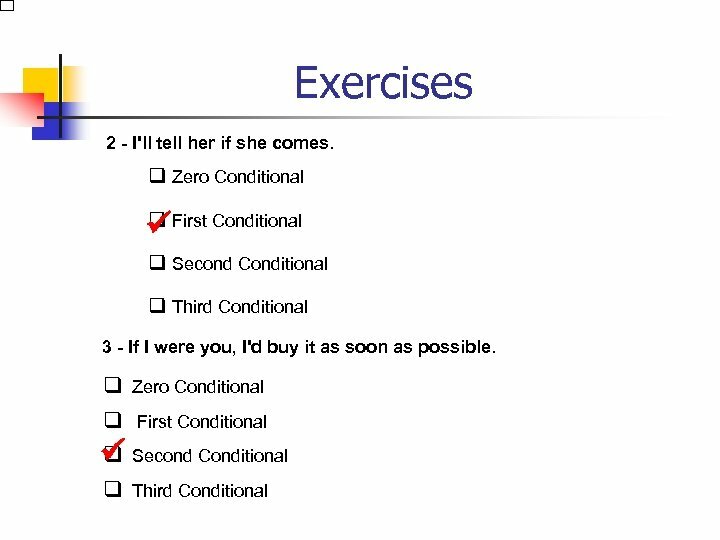 If I ________ (not fail) in the would have bought examination, my mother________ (buy) me a new computer. would have finished 3. 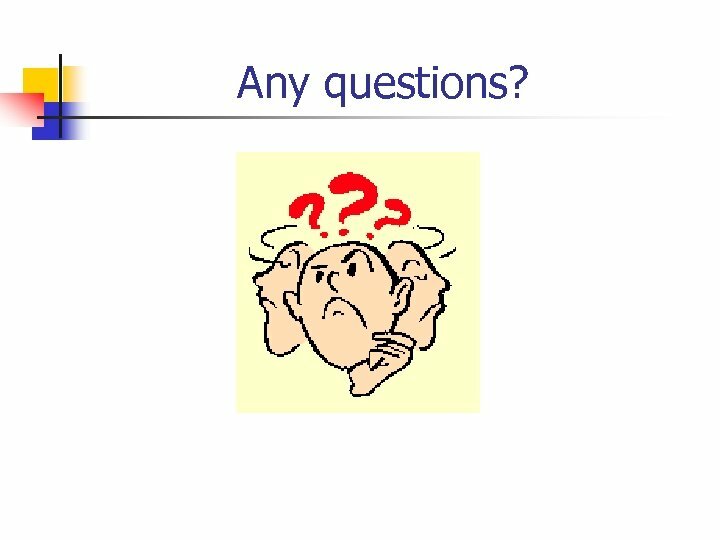 We ____________ (finish) if we had ________ (have) better preparation. 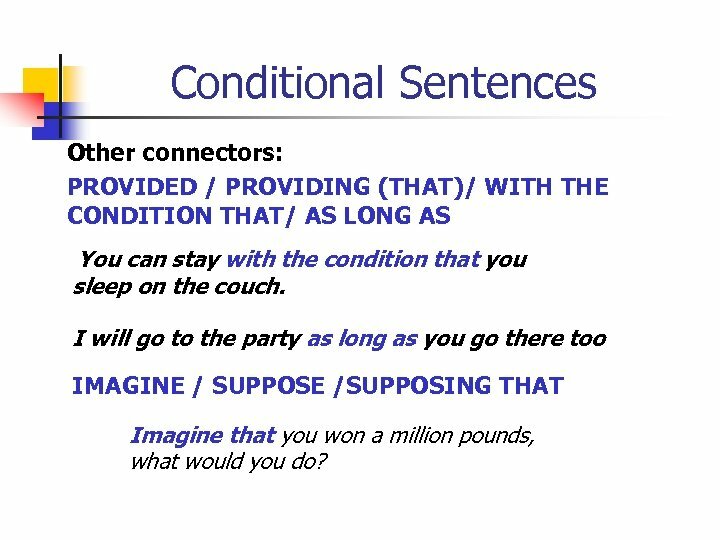 Conditional Sentences Other connectors: PROVIDED / PROVIDING (THAT)/ WITH THE CONDITION THAT/ AS LONG AS You can stay with the condition that you sleep on the couch. 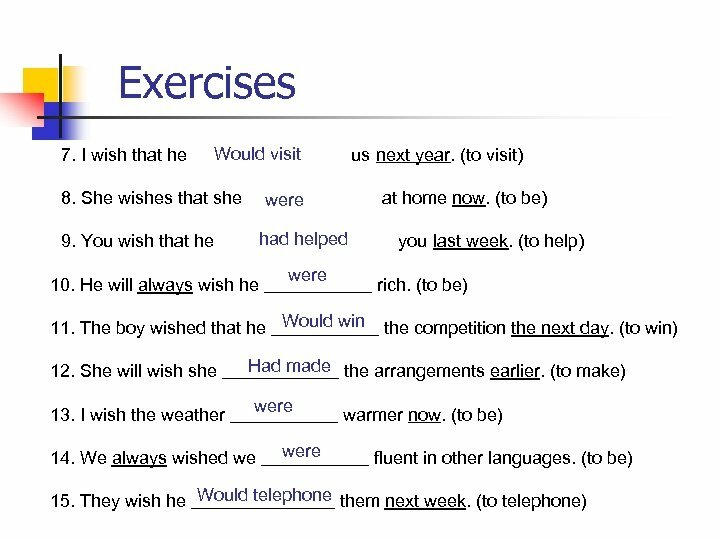 I will go to the party as long as you go there too IMAGINE / SUPPOSE /SUPPOSING THAT Imagine that you won a million pounds, what would you do? 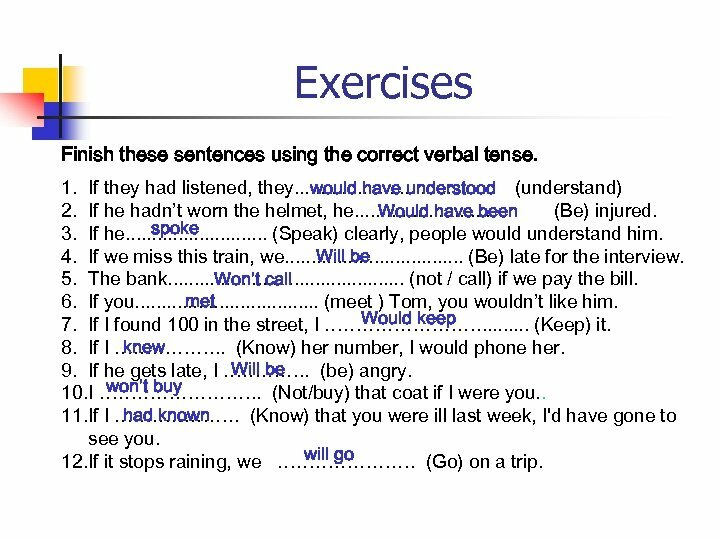 Exercises Finish these sentences using the correct verbal tense. 1. 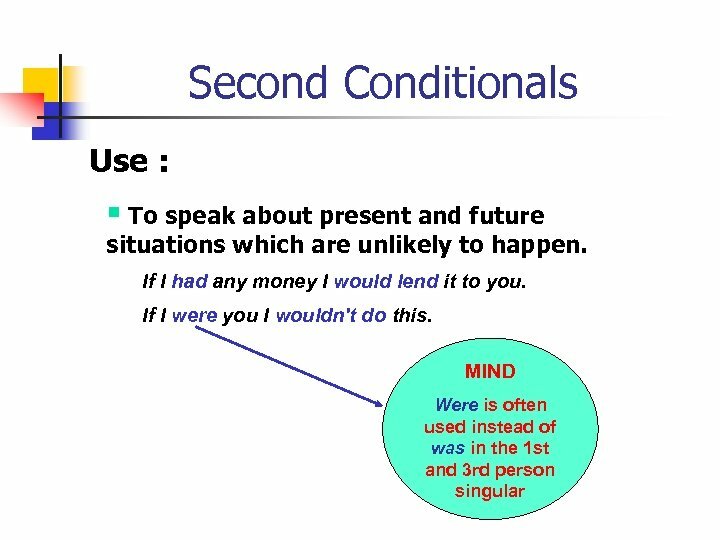 If they had listened, they. . . . would have understood (understand) 2. If he hadn’t worn the helmet, he. 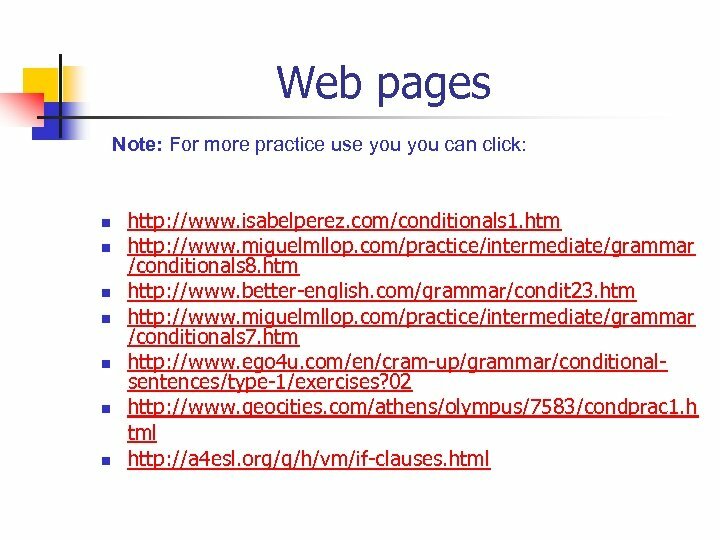 . . (Be) injured. 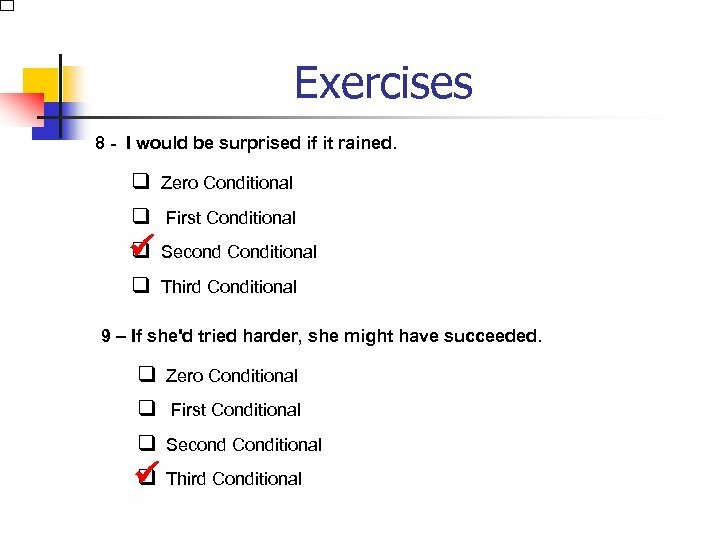 Would have been spoke 3. If he. . . . (Speak) clearly, people would understand him. Will be 4. If we miss this train, we. . . . (Be) late for the interview. Won’t call 5. The bank. . . (not / call) if we pay the bill. met 6. If you. . . . . (meet ) Tom, you wouldn’t like him. Would keep 7. If I found 100 in the street, I …………. . (Keep) it. knew 8. 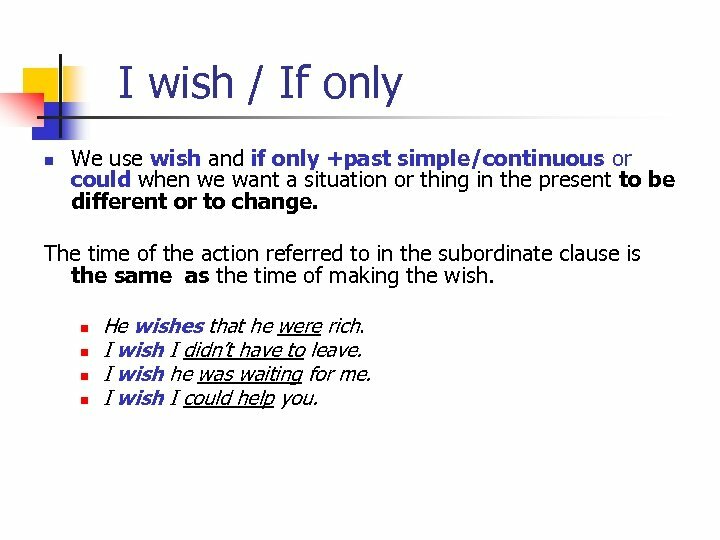 If I ……………. . . (Know) her number, I would phone her. Will be 9. 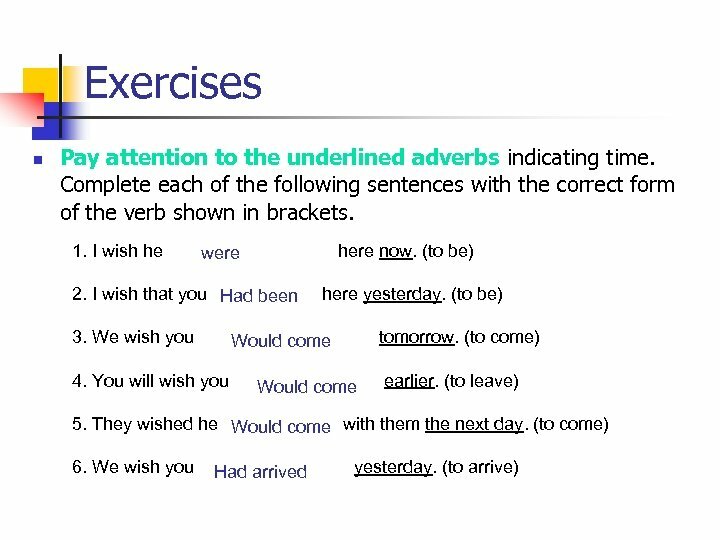 If he gets late, I …………. . (be) angry. won’t buy 10. I …………. . (Not/buy) that coat if I were you. . had known 11. If I ………………. . (Know) that you were ill last week, I'd have gone to see you. will go 12. If it stops raining, we …………………. (Go) on a trip. 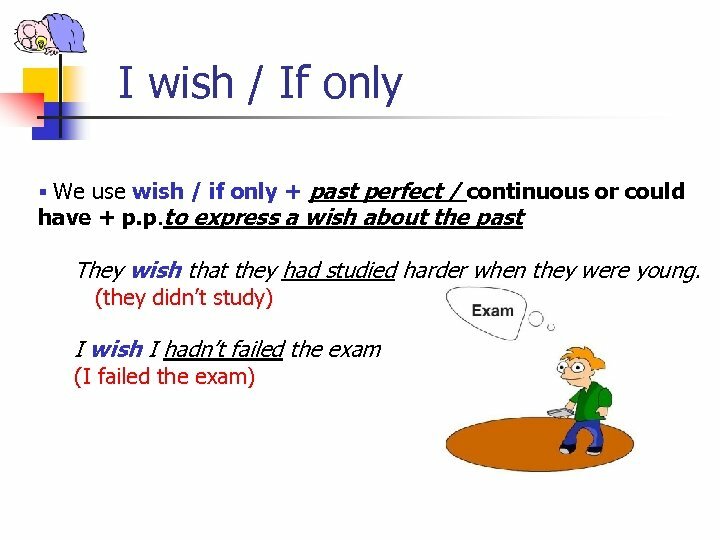 I wish / If only n We use wish and if only +past simple/continuous or could when we want a situation or thing in the present to be different or to change. 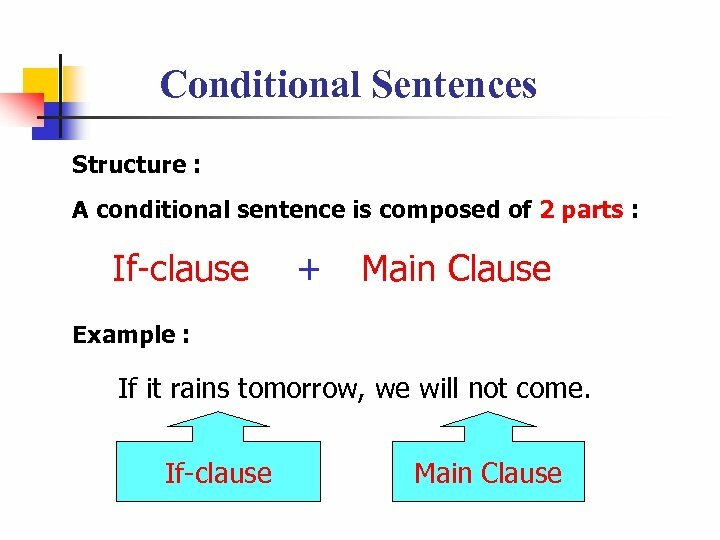 The time of the action referred to in the subordinate clause is the same as the time of making the wish. n n He wishes that he were rich. I wish I didn’t have to leave. I wish he was waiting for me. I wish I could help you. 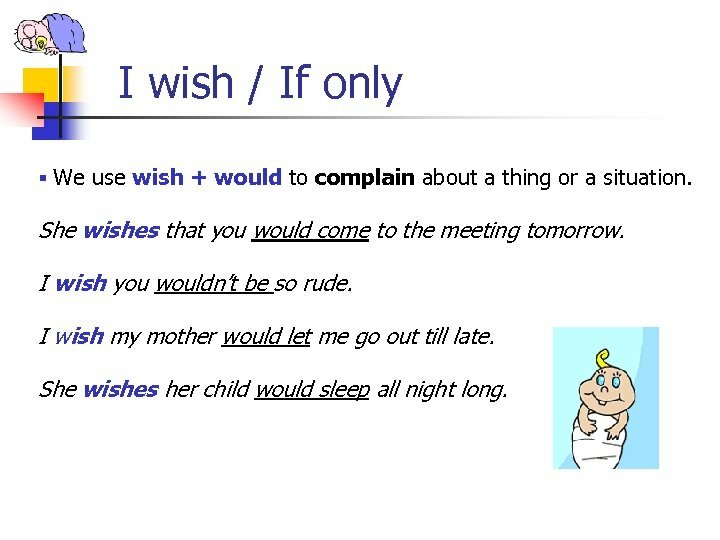 I wish / If only § We use wish + would to complain about a thing or a situation. She wishes that you would come to the meeting tomorrow. I wish you wouldn’t be so rude. I wish my mother would let me go out till late. She wishes her child would sleep all night long. 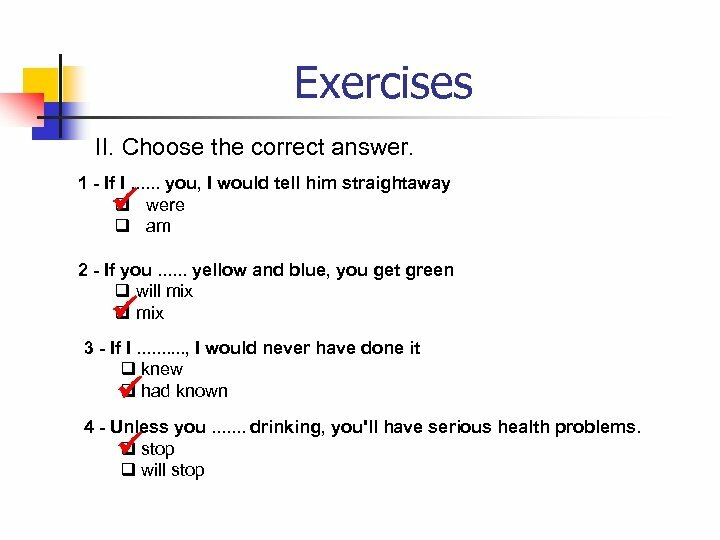 Mixed exercises n Choose the correct option 1. 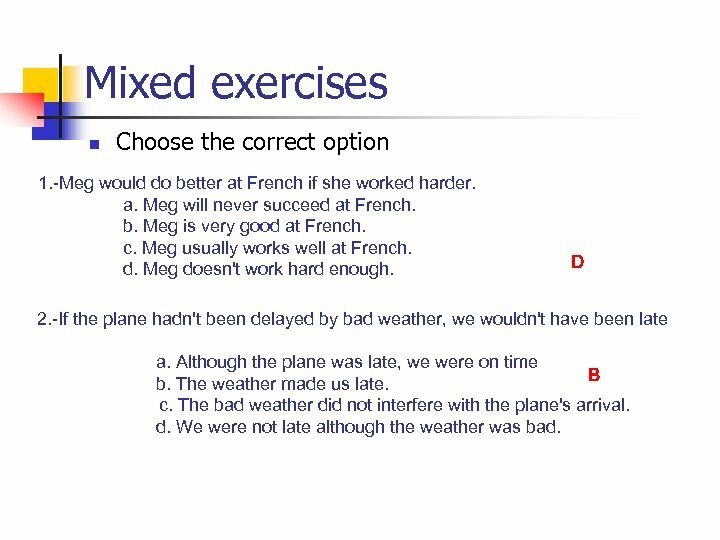 -Meg would do better at French if she worked harder. a. Meg will never succeed at French. b. Meg is very good at French. c. Meg usually works well at French. d. Meg doesn't work hard enough. D 2. -If the plane hadn't been delayed by bad weather, we wouldn't have been late a. Although the plane was late, we were on time B b. The weather made us late. c. The bad weather did not interfere with the plane's arrival. d. We were not late although the weather was bad. 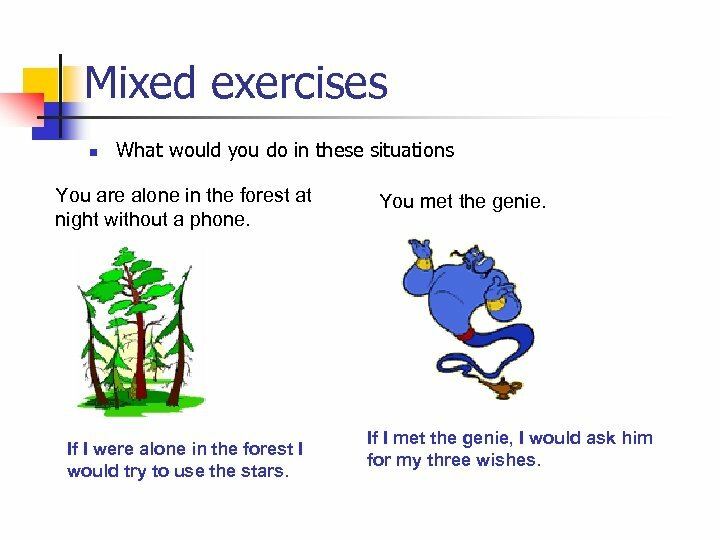 Mixed exercises n What would you do in these situations You are alone in the forest at night without a phone. If I were alone in the forest I would try to use the stars. You met the genie. If I met the genie, I would ask him for my three wishes. 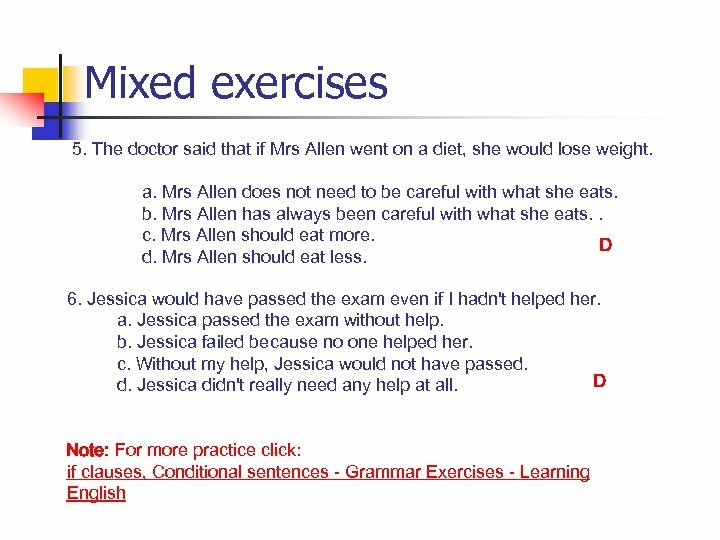 Mixed exercises n What would you do in these situations One day you read in a newspaper an article about you. The article was telling about your private life. 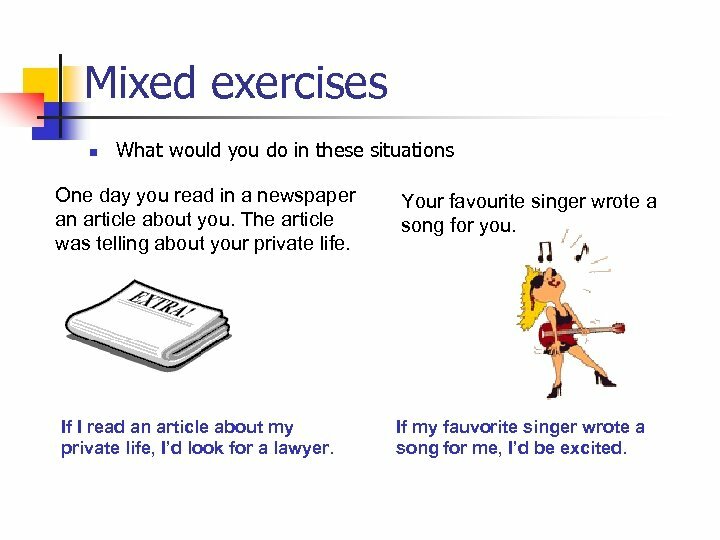 If I read an article about my private life, I’d look for a lawyer. Your favourite singer wrote a song for you. If my fauvorite singer wrote a song for me, I’d be excited. 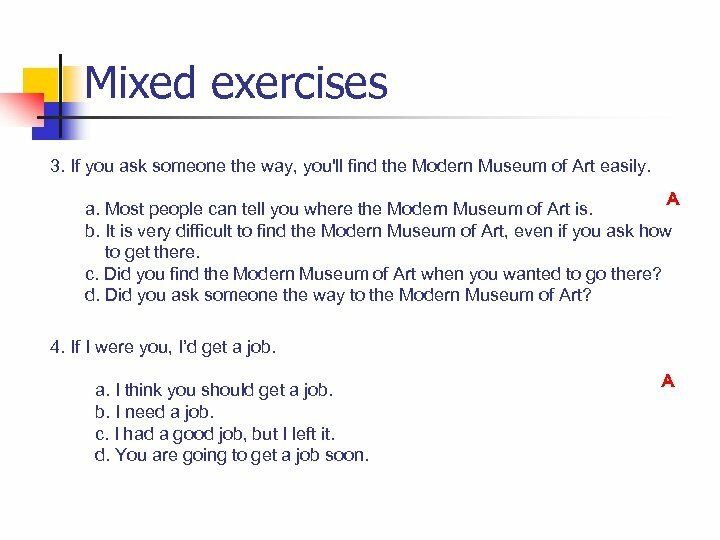 Mixed exercises n What would you do in these situations You are going to a date. But suddenly a bird made your jacket dirty. If a bird made my jacket dirty, I’d run to buy other. You enter the classroom and suddenly realize that you’ve forgotten to dress your trousers. 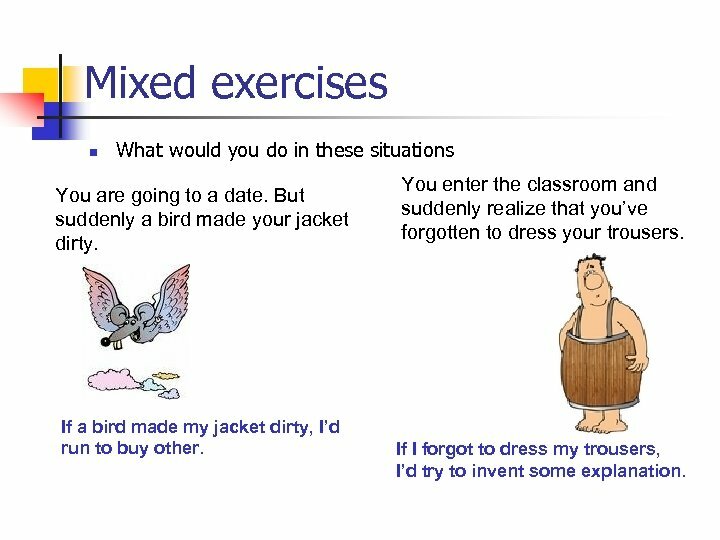 If I forgot to dress my trousers, I’d try to invent some explanation. 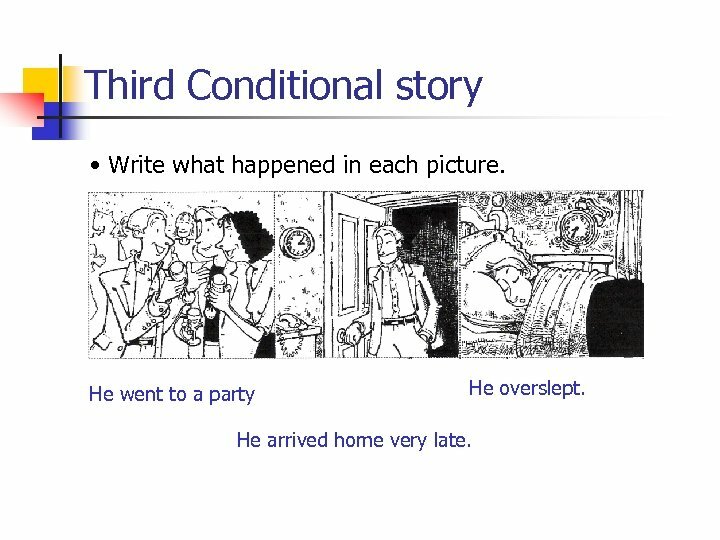 Third Conditional story Look at this photo story. 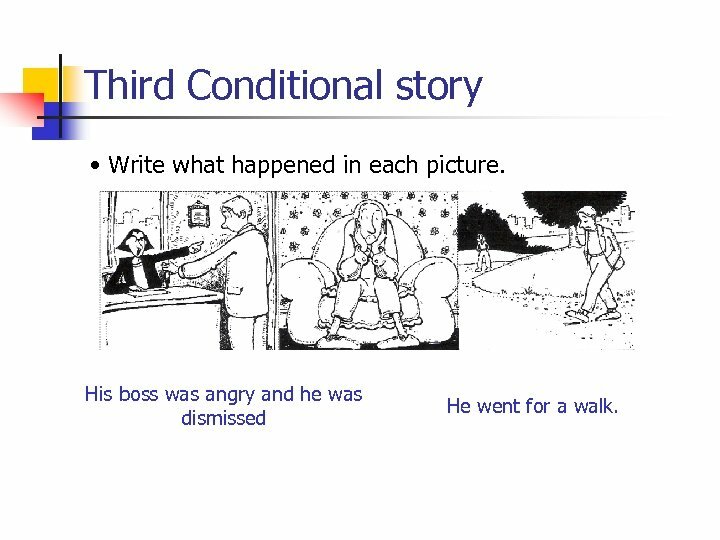 Third Conditional story • Write what happened in each picture. He went to a party He overslept. He arrived home very late. 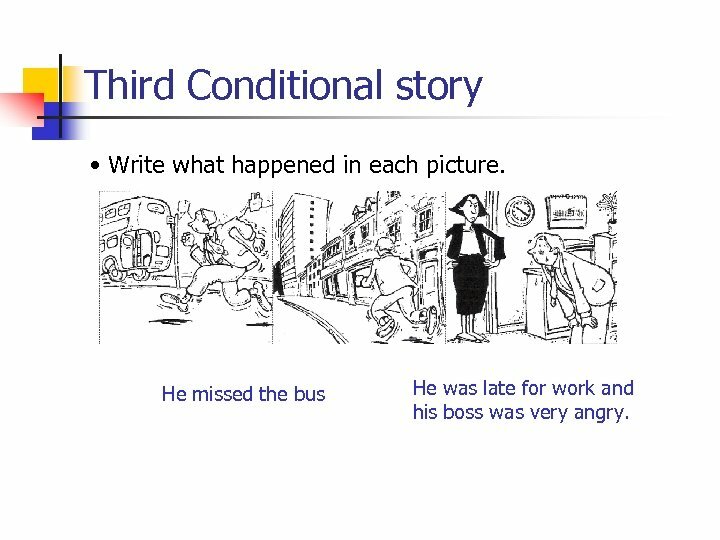 Third Conditional story • Write what happened in each picture. He missed the bus He was late for work and his boss was very angry. 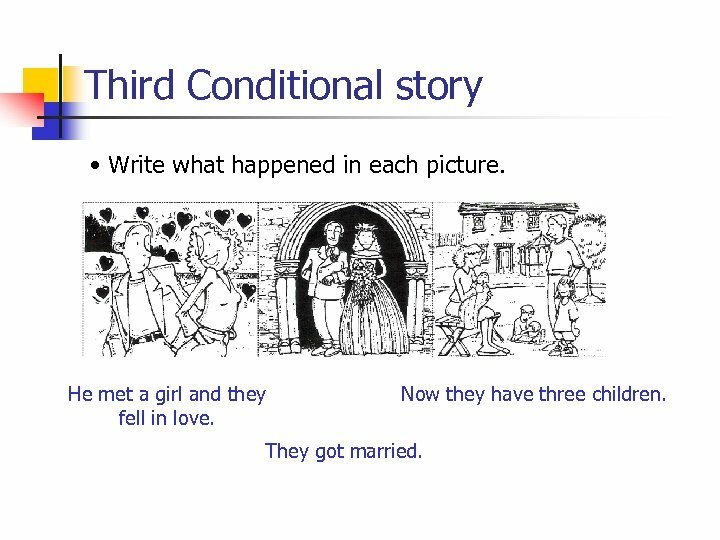 Third Conditional story • Write what happened in each picture. His boss was angry and he was dismissed He went for a walk. 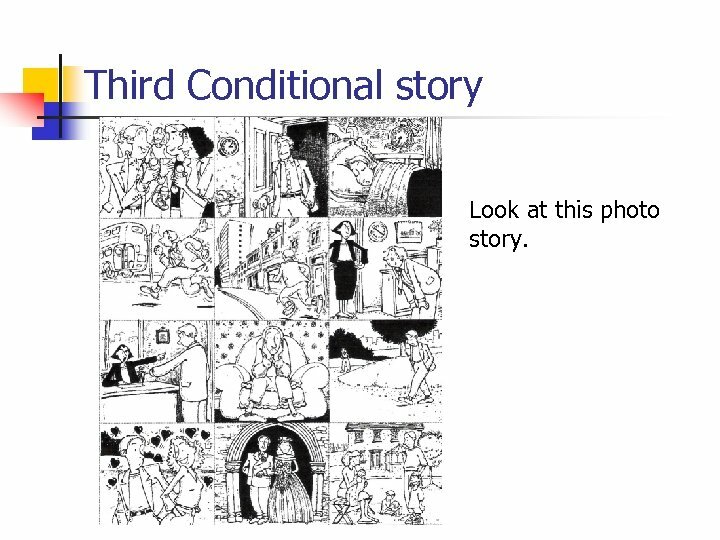 Third Conditional story • Write what happened in each picture. He met a girl and they fell in love. Now they have three children. They got married. 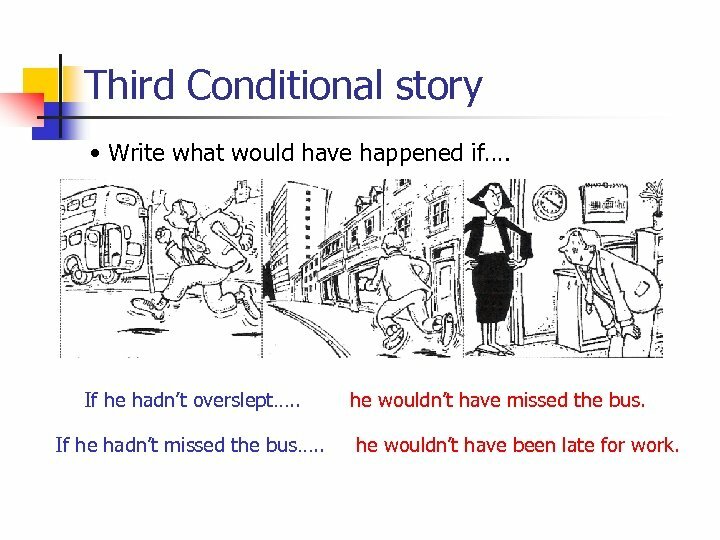 Third Conditional story • Write what would have happened if…. If he hadn’t gone to a party…. . he wouldn’t have arrived home late. If he hadn’t arrived home very late…. . he wouldn’t have overslept. 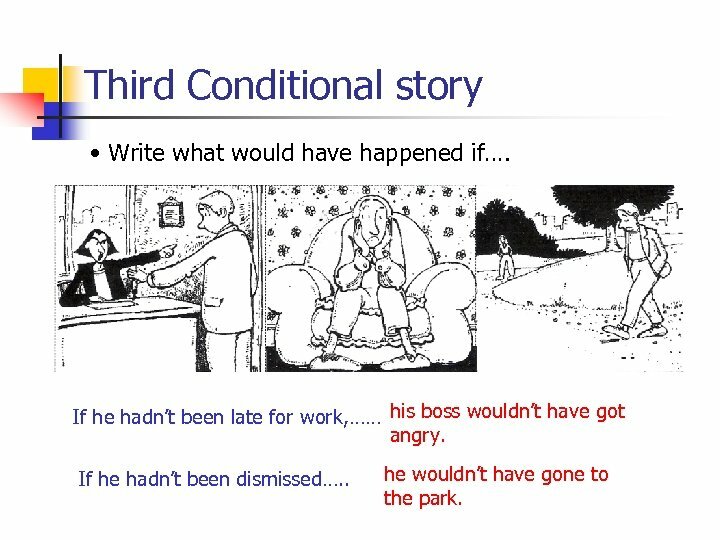 Third Conditional story • Write what would have happened if…. If he hadn’t overslept…. . If he hadn’t missed the bus…. . he wouldn’t have missed the bus. he wouldn’t have been late for work. 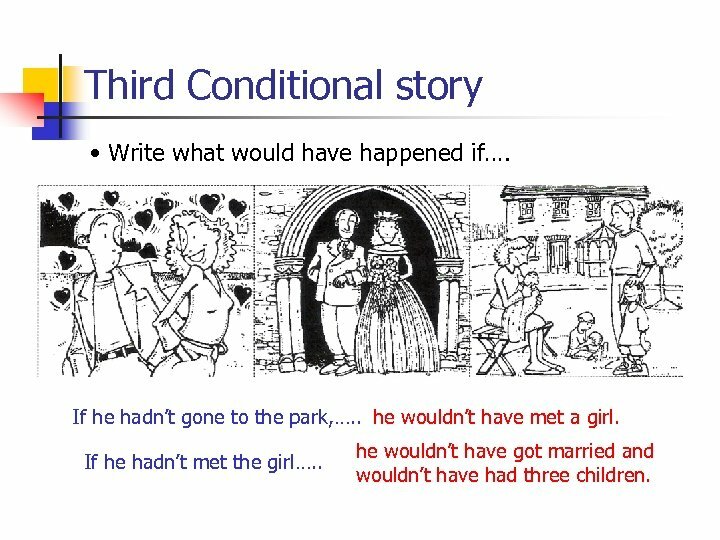 Third Conditional story • Write what would have happened if…. If he hadn’t been late for work, …… his boss wouldn’t have got angry. 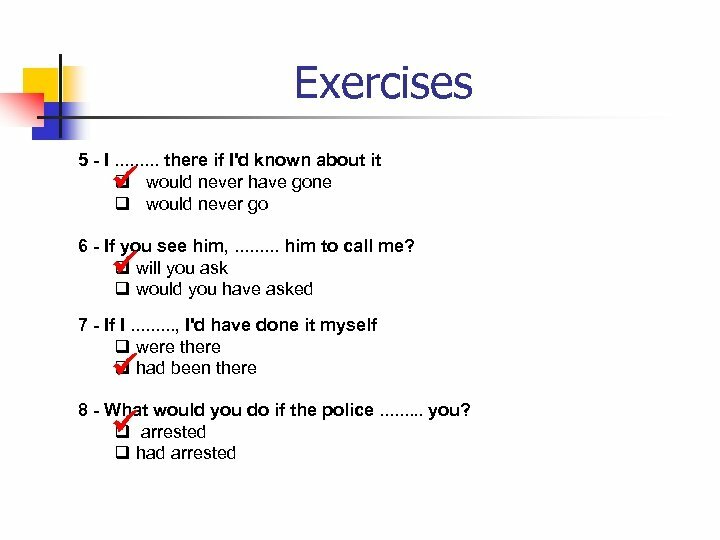 If he hadn’t been dismissed…. . he wouldn’t have gone to the park. 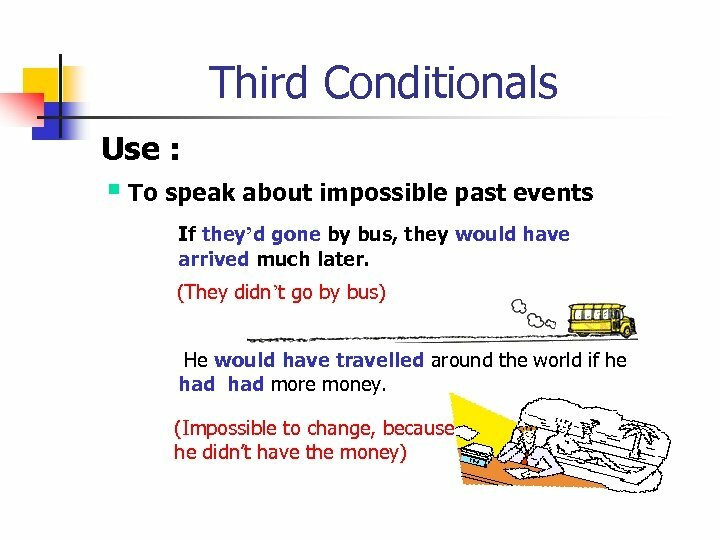 Third Conditional story • Write what would have happened if…. If he hadn’t gone to the park, …. . he wouldn’t have met a girl. If he hadn’t met the girl…. . he wouldn’t have got married and wouldn’t have had three children. 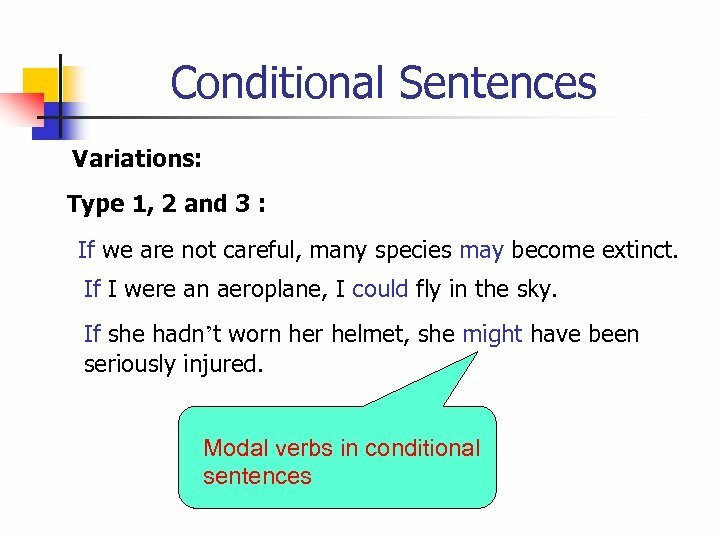 Third Conditional story • Therefore …. 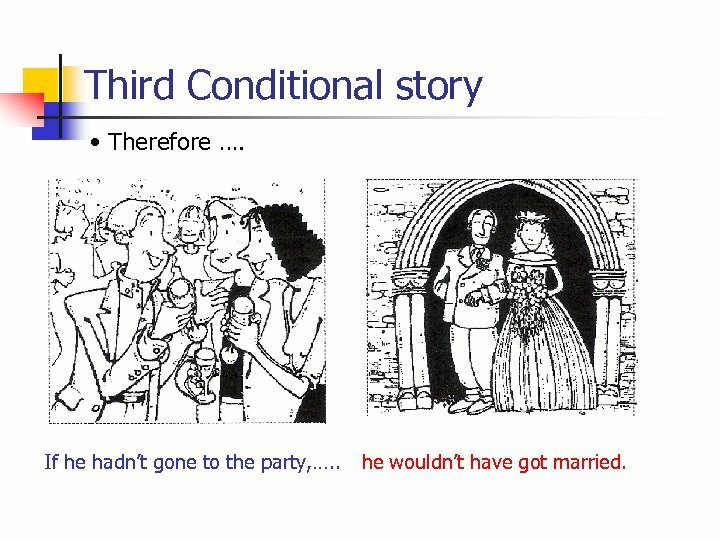 If he hadn’t gone to the party, …. . he wouldn’t have got married. 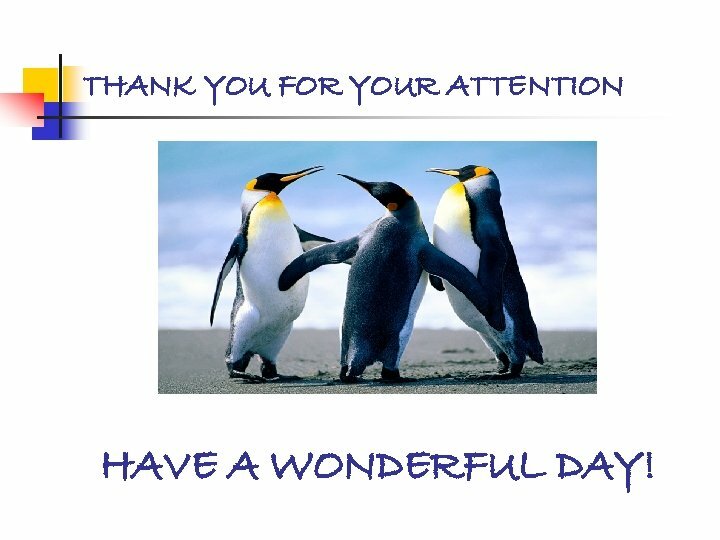 THANK YOU FOR YOUR ATTENTION HAVE A WONDERFUL DAY!